2-1-1 Shasta is the comprehensive information and referral service for Shasta County that connects callers and website users with information about local health and human services available ranging from basic needs to recreation (many of which are free or low cost). 2-1-1 calls are answered by trained Call Specialists who are available 24 hours a day, seven days a week. 2-1-1 Shasta also provides incident specific information in coordination with local emergency services during times of disaster, including road closures and shelters. Launched in 2011, 2-1-1 Shasta was the first active 2-1-1 North of Sacramento. As a local, private, non-profit organization with a 501(c)3 status, 2-1-1 operates thanks to local grants and donations. Be sure to check out our Funders – they make 2-1-1 possible in our community! You can connect with a 2-1-1 Shasta Call Specialist by calling 2-1-1 or by texting your zip code to 898211 (txt211). If you are in another county, call 855-211-7822. 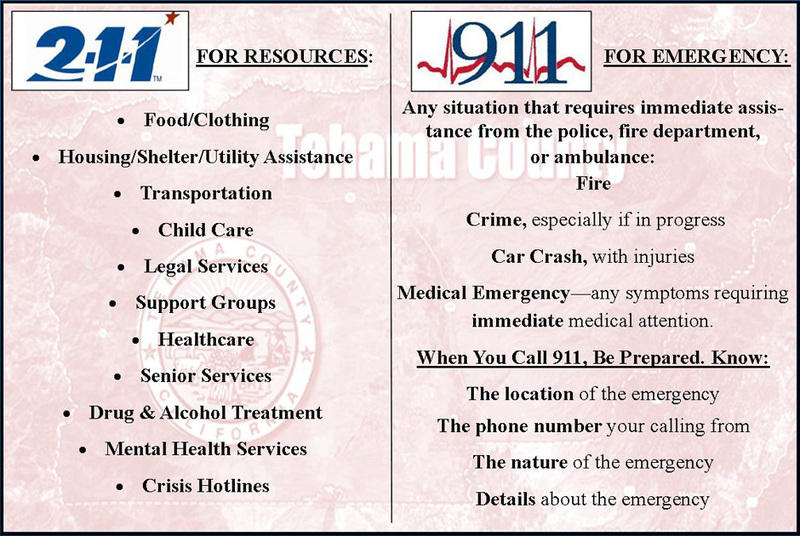 You can also search the 2-1-1 resource database online here on www.211shasta.org. To find toll free numbers for 2-1-1 services across the country, visit www.211.org. Do you have more questions about 2-1-1 Shasta?